On a prominent street corner across from the US National Archives in Washington, DC, sits a stoic granite obelisk. 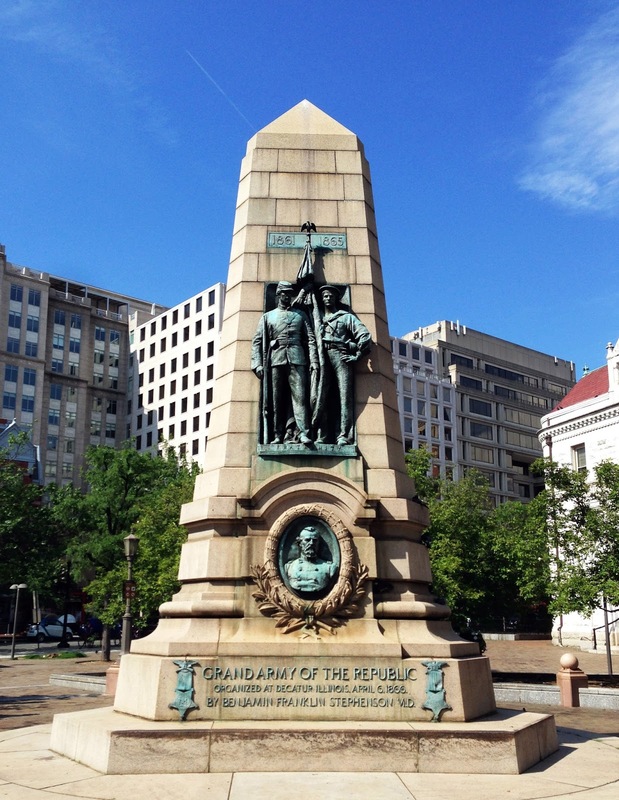 Two bronze soldiers embedded in the hulking stone overlook the oblivious mobs of tourists exiting a nearby metro station and making a beeline for neighboring museums. The youngest of four sons, Albert Benedick - my third great-grandfather - watched as each of his brothers enlisted in Ohio's volunteer forces beginning in late summer 1861. By early spring 1865, the Civil War was finally coming to a close with the Union's victory visible on the horizon. On February 16, 1865, Albert was done watching. Eager to play his part, he completed enlistment papers and gave his age as 18. Born on March 8, 1849, Albert was in fact only 15 years old. 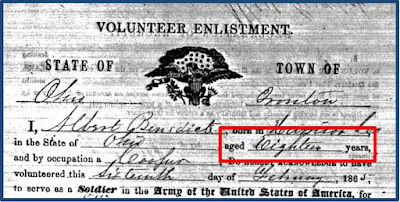 While the majority of Union forces were between the ages of 18 and 45, it wasn't uncommon for boys as young as 12 to enlist.2 The minimum enlistment age was 18, otherwise parental consent was required. Anecdotes from the time tell of boys writing the number 18 on a piece of paper and placing it in their shoe, so they could honestly say they were over 18 when enlisting.3 With three of her sons already serving, I speculate that Albert's mother wouldn't consent, which prompted him to fudge the numbers. 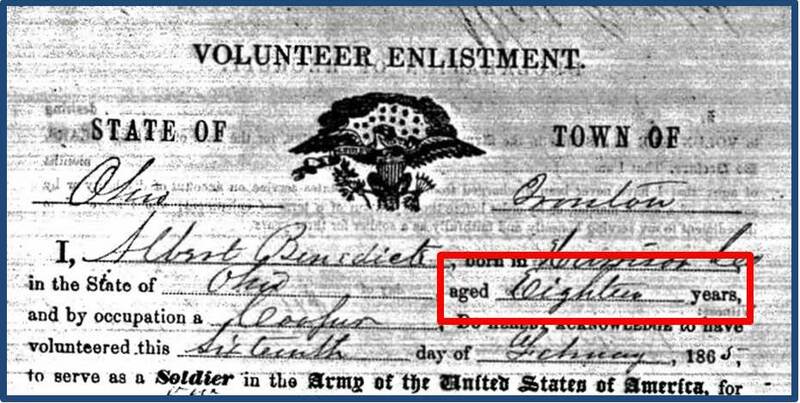 Albert's enlistment as a sergeant in the Ohio volunteer infantry was likely not what he expected. Perhaps he envisioned a romanticized notion of courageously fighting for his country. Instead, he quickly fell ill with the measles and was checked into a military hospital in Murfreesboro, Tennessee on March 20, 1865 (less than two weeks after his 16th birthday). Later, writing in support of his pension application, his brother John told how Albert "came very near dying" and even lost his ability to speak for several weeks. More about the dramatic toll of the illness is in the post Disease in the Civil War. 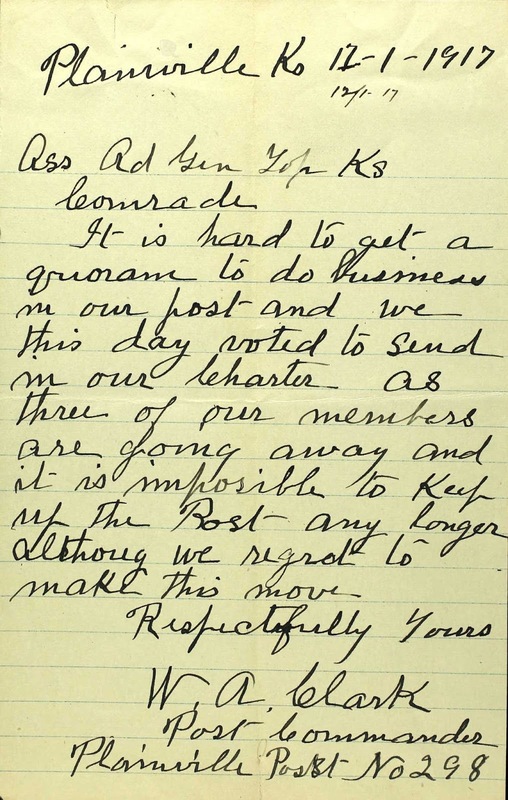 In an undated letter, perhaps 1883 or 1884, 18 veterans wrote to the Kansas Department Commander of the Grand Army of the Republic requesting a charter for the creation of a GAR post in Plainville, Kansas. Among the signatories was Albert Benedick. 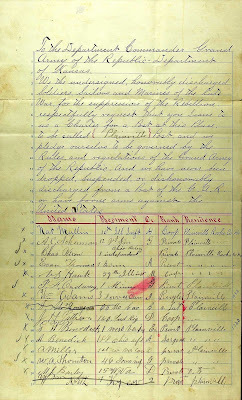 These original charter members affirmed that they were "honorably discharged" soldiers from the "late War for the suppression of the Rebellion." 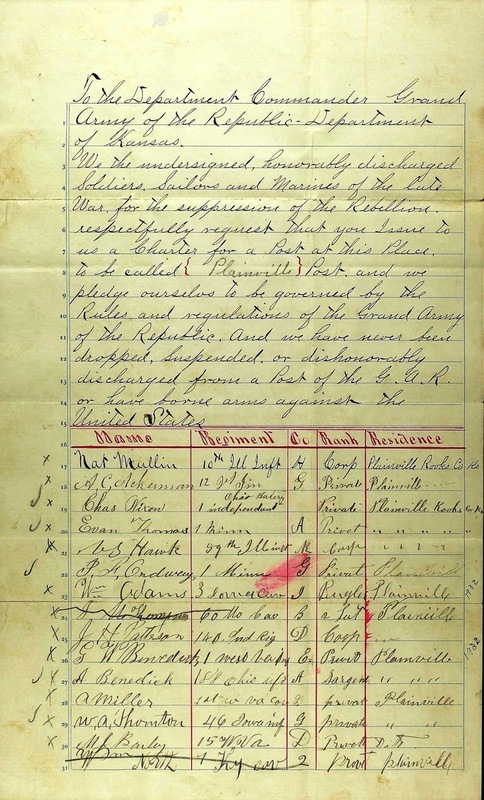 The charter was granted on January 7, 1884, and the group (now Plainville Post 298) determined that they would meet monthly "every Saturday evening after the full moon." Over the ensuing years, Albert held several leadership positions within the organization, including Post Commander (PC), Senior Vice Commander (SVC), Junior Vice Commander (JVC), Surgeon (PS), Sergeant Major (SM), Officer of the Day (OD), and Officer of the Guard (OG). Membership in the GAR was clearly something that meant a great deal to Albert. Not only did he take on a variety of leadership positions, but he wore his pride on his sleeve, or rather on his lapel. In two photos, you can make out his GAR membership pin. As time went on and veterans began to pass away, the Plainville, Kansas GAR post saw its membership begin to decline. In April 1889, membership peaked at 44 veterans but slipped to 23 by December 1900. In June 1917, membership was reported to include just 10 men. Albert was still among them. In December 1917, Post Commander W.A. 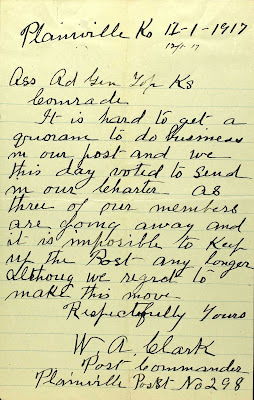 Clark wrote to GAR Kansas headquarters to inform them that "it is hard to get a quorum to do business in our post..." With three more members moving away from Plainville, "we this day voted to send in our charter...it is impossible to keep the post any longer although we regret to make this move." Albert passed away on February 14, 1931 when he was 81 years old. His initial death notice published in the Plainville newspaper touted that he was "one of the last three members of the Plainville GAR Post which had 85 members 30 years ago." Curiously, the Plainville GAR quarterly reports never reported membership near 85 men, but the sentiment remains. A generation that fought to salvage the Union was slipping away. 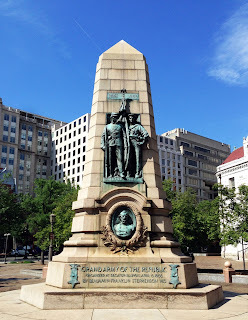 I can only imagine what Albert thought as his fellow soldiers moved or passed on, and he found himself one of the final few in town who recalled the hellish experience of the Civil War when men forgot the better angels of their nature. I imagine he found healing in the camaraderie of the Grand Army of the Republic. 1 "Grand Army of the Republic History." 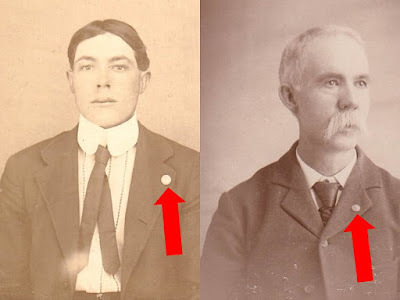 Sons of Union Veterans of the Civil War. 2 "Who Fought?" Civil War Preservation Trust. This is an excellent introduction to the GAR and an intriguing look into your ancestor Albert's young life as a soldier and then as a proud veteran. Thanks for sharing his story. Thank you for your comments, Lisa. I appreciate it! And I LOVED seeing the photograph of him as a young soldier. Where did you find that treasure? 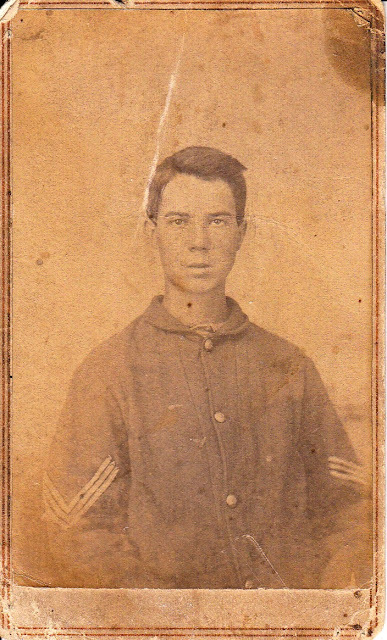 I inherited the Civil War photo in an old family photo album that was in my grandmother's collection. 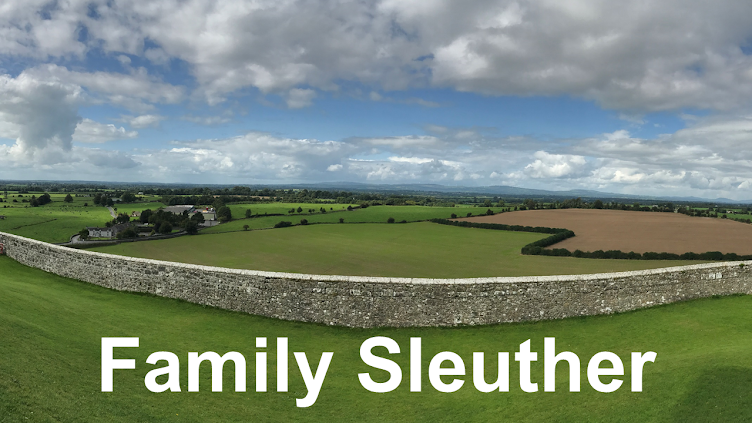 It's a real family treasure.